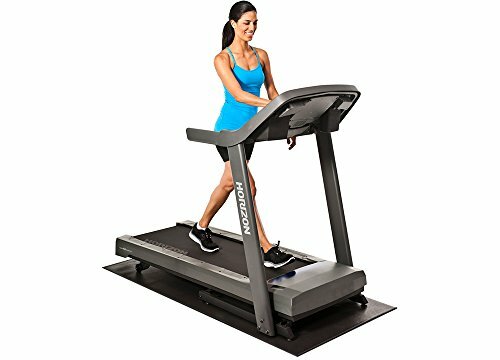 Rated by the Treadmill Doctor as one of the “Best Buys” in its category, the new T101 treadmill includes a powerful, quiet motor and stable, comfortable platform. This is combined with a comprehensive console and Sonic Surround speakers with MP3 input so you play music through the console speakers. A strong frame that doesn’t shake when you run will give you the confidence you need under your feet to stick with your program. Horizon Fitness treadmills have more welded steel components, making them easier to assemble and among the strongest and sturdiest around. The perfect Variable Response Cushioning deck provides the right mix of shock absorption and support for less strain on your feet, ankles, knees and hips. And the COOL fit fitness fan keeps you cool as you walk, jog or run, giving you a more comfortable workout. It’s easily storable, thanks to Horizon’s exclusive Feather LIGHT lift, which incorporates two hydraulic shocks to assist you when raising and lowering the deck. The computer console has a 5″ green back-lit LCD display so you can quickly see your workout stats. You’ll be able to challenge yourself and reach your fitness goals with 30 programming options that include a manual workout, 10 Step-goal workouts, 10 distance-based workouts, 6 calorie-goal workouts and 3 intervals workouts.